Seated are, from left to right, Mayor Steve Benjamin, developer Bob Hughes and moderator Jim Hammond. This morning’s edition of Columbia Regional Business Report’s “Power Breakfast” series featured Mayor Steve Benjamin and developer Bob Hughes talking up Bull Street and baseball. Don’t read too much into the tie. 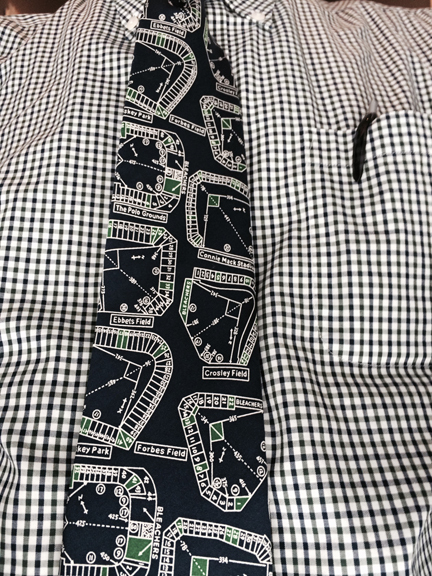 I had overslept and dressed in a rush for the hyper-early event, and didn’t realize until I got there that I had worn my tie with the layouts of classic Major League ballparks on it. As I hastily explained to Mike Fitts when I saw him there, this should not be construed as a sign of support on my part. I’m still sort of ambivalent about this thing. I, too, think minor league baseball could be very, very good to us, but I always wanted it down by the river, so… I don’t know how I feel about this consolation prize. Also, I don’t know what to think about Bull Street overall, and I think part of the reason for that is that I still find it hard to envision. I get what Mr. Hughes says about the specifics of what will actually be there and how it will ultimately look will develop in an “organic” manner over the next couple of decades, and will largely be driven by market forces. But that makes it hard for me, and others, to make up our minds about it. Which, I know, has been infinitely frustrating to the mayor, who believes, as he reiterated, that we have to stop “kicking the can down the road” on this unique urban fixer-upper opportunity. As a representative of ADCO, I wasn’t too thrilled with his complaint that “I’m tired of Columbia always making excuses for being hot.” He said it’s 6 degrees cooler than Dallas here, and this development is about showing people in a concrete way how much cooler we are. The ballpark was repeatedly touted as a necessary spark to draw the rest of the kind of development that will be needed for the project to succeed. Not having it, in the minds of potential investors/developers, would have been a deal-breaker, Hughes asserted. Now that it’s a done deal, everything can proceed. 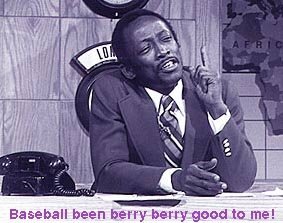 He said more and more such developers are interested, even enthusiastic: At recent development gatherings across the country, the questions his team gets from potential developers have changed in a positive direction, going from “Why would I want to go to Columbia?” to “How big can my sign be?” and “When will the first pitch” be thrown in the ballpark. When is “the beginning?” The plan is to start “moving dirt” this summer, and work will start on the ballpark in the early fall. We’ll see the first residents in August 2015, and “hotel, retail and baseball” up and running in April 2016. Possibly the least sensitive remark of the morning was something that Hughes quoted to the effect that “Old brick is depressing; that’s why nobody ever left this place.” I didn’t hear who he was quoting and I missed the larger point he was trying to make about the look of the place. He did say that five buildings will be preserved, which he said represented about 75 percent of the square footage of the most comprehensive wish lists for historic preservation that he’d seen. There was a lot of talk about walkability and bikeability. One person asked how the development would be accessible by bike from the established neighborhoods across Bull Street. Hughes gave perhaps his weakest answer of the morning to that, suggesting that cyclists could cross at the light. Then he said something about a tunnel that runs under Harden perhaps being employed for that purpose on the eastern side. Hughes noted with regard to the $31 million in publicly-funded infrastructure, “It takes me 20 years to get that.” Benjamin added, “20 years, and benchmarks that have to be met along the way. “This project’s going to be judged by its success,” Benjamin asserted. In response to a question about opposition, he said, “I talk with people every day who are very excited.” He spoke of touring Charleston with Joe Riley, “the dean of mayors in the United States,” who spoke of building things that have “a permanent impact on a city.” Benjamin added, “In 50 years, no one will remember what the unemployment rate was,” or the crime rate. Or, he hopes, how acrimonious was the debate over Bull Street. He believes its success will wash all that away. Is Runyan taking a responsible stand, or avoiding taking a position? Does everything come in twos now? This entry was posted in Business, Community, EcoDevo, Midlands, Planning on May 22, 2014 by Brad Warthen.